I'm a bit late to the party here, but I figured since I set so many goals for myself this year, I should actually talk about what my 2014 looked like in terms of blogging. In brief: 2014 was not a particularly good year for me as a blogger, which isn't actually a surprise. I've been a somewhat lax blogger for the past few years, in part because I've diverted so much of my attention to The Skiffy and Fanty Show and to Twitter conversations. There has also been a fair amount of burnout from time to time, particularly when the blogging community started to tank a few years back (it seems to have stabilized now). That said, looking at my statistics, it's clear where my blog fell off the train in 2014, which gives me insight into how I might improve the blog in 2015. The following charts and analyses were based on Google Analytics, which is not a totally accurate measurement, but the best option I have for detailed data (Blogger's stats are actually better ones to look at, but they allow less fiddling, so I can't get the depth I need). I spent considerably more time traveling last year than I had in 2013. Last year, I attended four conventions (ICFA, CONvergence, Worldcon/LonCon3, and World Fantasy Con); in 2013, I only attended two (ICFA and Worldcon/LonestarCon). One of last year's conventions was the result of a fundraiser, which took up a lot of my time, so much so that I put most of my focus on the 2nd item on this list. Podcasting! The Skiffy and Fanty Show had what I hope was a banner year. We rolled out The World SF Tour, explored literature from a bunch of places outside of the U.S. (not as many as I would have liked), and we recorded and released more podcasts than we ever had before. Since most of the podcasting "work" is done by myself, that is a serious time commitment. Speculative Fiction 2014 became a thing. It involved an extraordinary amount of reading -- as much, if not more, than the next item. Hugo Award Reading. I spent a good portion of the first few months of 2014 trying to catch up on short fiction so I could actually vote. Part of 2015 will be spent doing the same. I responded to more controversies in 2013, including the SFWA Bulletin fiasco and the diversity is a selfie thing. I did not do so as much this year. One of my popular posts was a rant/review of Riddick. 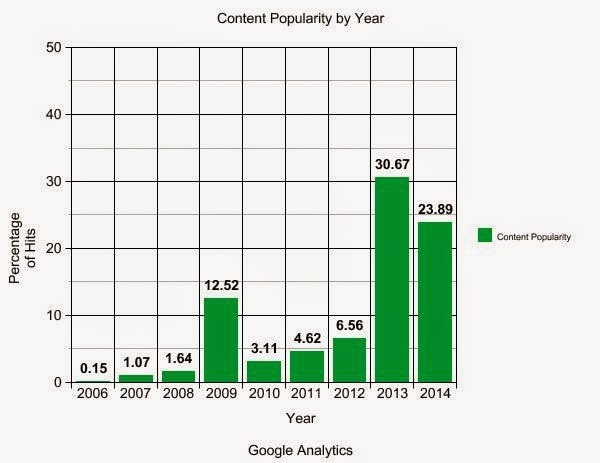 It is by far the most popular 2013 post on my blog which can be disentangled from link bots. Other super popular posts include a top 10 list of the best SF/F films since 2010 (at the time, that is) and a post on the vigilante in American Mythology. These posts consistently appeared in the top lists for most visited posts on my blog throughout 2014. I was just more interesting in 2013. It's true...I had the Retro Nostalgia feature going, which was reasonably popular (one appears in the top 10 list below), and every feature I tried to start in 2014 fell flat due to time constraints, lack of interest (on my part or on my readers' part), and lack of motivation. In fact, I would wager to guess that the above chart is a reflection of my blog's "quality" or "interesting-ness" within certain years, with exception to the first two years of its existence, which were demonstrably terrible. Seriously, don't read anything I wrote in 2006. Please. One thing that becomes apparent when I look at my stats is this: I should talk about movies more often, as that seems to be a consistent "hitter" for my blog, regardless of the quality of the movie. Whether I'm talking about a classic like Legend or a stinker like Riddick, sf/f movies seem to drive more traffic to the blog. Go figure. Some posts would have made it into the top 10, but because I used "landing pages" as the basis for the list, they were not counted. Their hits likely came indirectly from a feed burner of some kind. These include my February 2014 post entitled "On the SFWA Bulletin Petition Thing Nonsense,"my March 2014 post entitled "Great SF/F Books by Female Authors: A Massive Twitter List! #sffbywomen," and the announcement for Speculative Fiction 2014, for which I am co-editor. 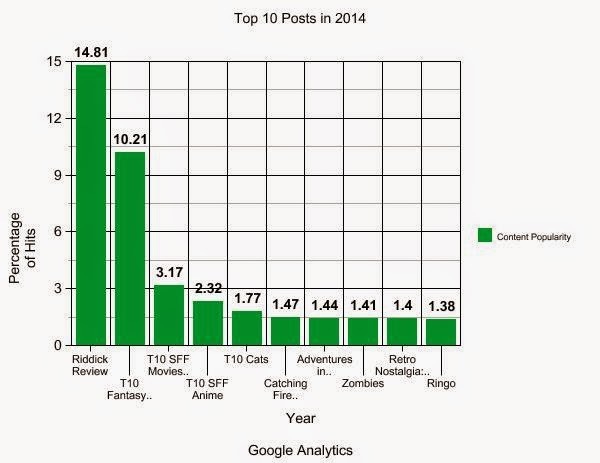 Another post that was popular but mysteriously doesn't show up in my Google Analytics top 10 is my 2014 post on on science fiction as a "supergenre." It received considerably more hits than the average post on my blog, but it seems to have been forgotten by Google for some reason. Again, it's apparent that when I discuss movies or controversies, my blog receives more attention, which I suspect is a result of talking about movies more often than I talk about books. Part of this can be blamed on being extremely tired of books after spending all day dealing with them at work or as part of my dissertation. Part of it could also be blamed on the fact that people just like when I talk about controversial crap or movies more than when I talk about other things. It's hard to say without surveying actual readers. 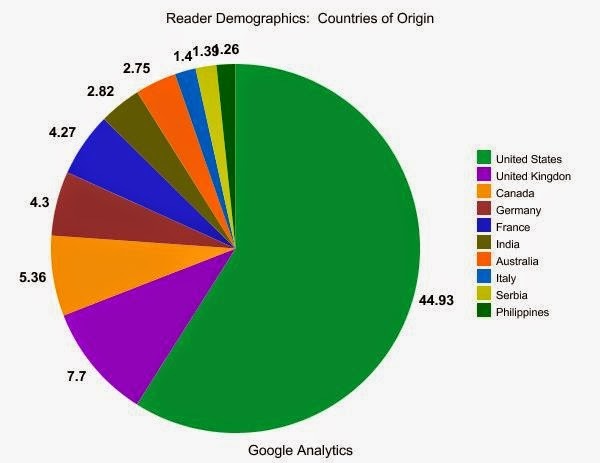 Since I'm located in the U.S. and am more likely to meet fans, authors, and so on from or within the United States, it's not a surprise that almost half of my readers come from the U.S. What I find most interesting is the fact that the Philippines and Serbia have somehow snuck their way into the top 10. Given that I know so few people from the Philippines (and none from Serbia as far as I can tell) and that I can't recall discussing either nation at any length on this blog, it is truly curious why I have any popularity in those areas at all. Then again, the Internet is a weird beast. That said, I love the fact that there are people around the world actually reading this blog. In fact, people from 181 different countries visited my blog last year (208 since I started using Google Analytics). That's pretty cool, if you ask me. Additionally, the most common cities from which users viewed my page were (in order from most common to least): New York, London, Sombor, Toronto, Melbourne, Los Angeles, Sydney, Beverly Hills, and Seattle. This reflects a heavy focus on the West in the chart above and, I suspect, population density. I wouldn't be surprised in sf/f fans/readers/blog readers were more heavily concentrated in the cities listed, though I have no way of knowing that. The numbers from the last few years have actually shown a dramatic shift in the top two slows. In 2010, the majority of viewers were using Firefox (58.7%), with Chrome squeaking by with 15% of the viewership. 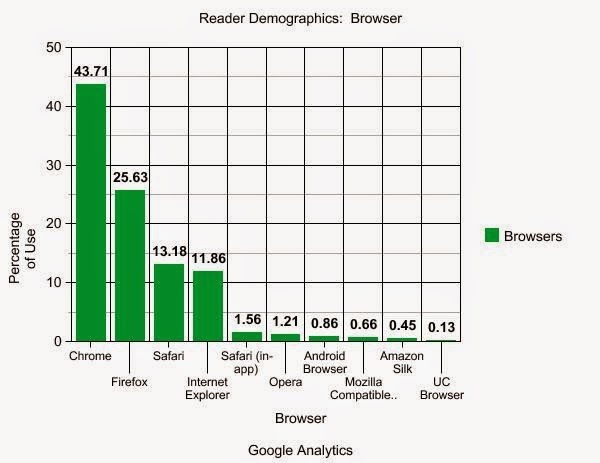 Since then, I've seen a steady climb of Chrome users vs. Firefox users (even Safari has increased in use by about 10%). It will be interesting to see how these stats change in the next two years, but it's clear now that the dominant browser is Chrome, not Firefox or Safari. And for your last fact of the evening: though Chrome is the most popular browser used to view my website, it is not the fastest. Internet Explorer, it turns out, loads my page 3 seconds faster than Chrome, 9 seconds faster than Opera, 11 seconds faster than Safari, and 15 seconds faster than Firefox. Why? No idea. But it's interesting. On that note, I'm going to go back to work!